Amid the decade’s activism and counterculture, many in academia saw and responded to the absence of the histories and perspectives of people of color from classrooms and curriculums. 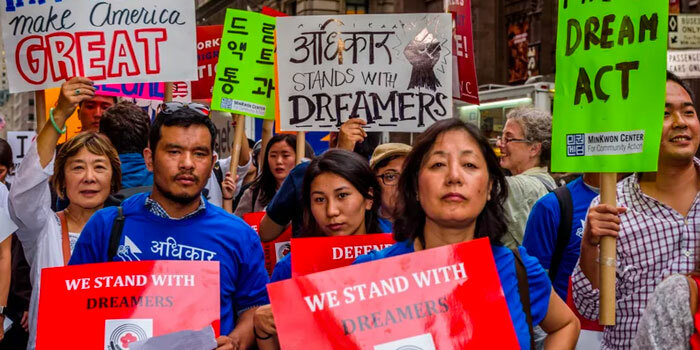 Asian American Studies became one of several fields seeking to examine issues of identity but has remained small over the years, and has only recently begun to grow and expand its prominence in academic thought. The relevancy of the field remains just as large as it has ever been, but now the demand for it has increased. At Haverford, seniors Rebecca Chang ’19 and Liana Shallenberg ’19 want to see that demand reflected. Working with the Hurford Center for the Arts and Humanities and with Assistant Professor of Psychology Shu-wen Wang, they created a student seminar this fall: “Asian/America: A Search for Belonging.” We met to answer some questions about creating and leading their seminar. Why did you first think of running one of these seminars? Rebecca: Liana and I took classes that were related to Asian American studies in some way. There’s very much a lack of courses on the area. I took one on global histories of Asian American labor, and Liana took one on Asian American psychology. I think for me, that was my first time being in a classroom and feeling like “hey, this is a real subject being legitimized in academia right now, with academic readings and academic discussions.” That class was one of the very few classes we offer in Asian American Studies at Haverford. That made me think that we really don’t have these kinds of classes at Haverford and there’s definitely interest in it. I heard about the Hurford Center student seminars and I thought it would be really cool to lead one together with Liana. Liana: The class I took was “Asian American Psychology,” which is offered at Bryn Mawr by Professor Heejung Park. There’s a lot of interest in Asian American Studies—the class was overenrolled and they had to cut people out because it was a seminar. That was really sad because this is one of the only Asian American Studies classes offered in the Bi-Co. But there aren’t enough resources to accommodate that many students. Lived experiences aren’t worth less than academic texts, but it was very cool to be able to read studies about how certain psychological theories and concepts that were so accepted and standardized looked very different depending on different groups of people. Shu-wen Wang is our faculty advisor, and she studies how Asian American communities deal with mental health in different ways, systems that tend to be very different from European Americans ones. How did you plan and decide what your seminar would include? Liana: We drew a lot from the two classes that we took—readings and material we either read in class or heard about from our professors. We were also interested in an interdisciplinary approach. I was coming from a psychology background, Rebecca is majoring in cities, and my class was a history class. We had a few graphic novels in our syllabus, a documentary, as well as some psychology and news articles. Rebecca: There was a lot of regard for our own personal experiences. We found some things that neither of us had read or been exposed to, but most of it was one of us saying “write that!” or “write that!” and compiling it all together. We had to do a lot of cutting down. This syllabus is not an exhaustive list of what Asian American Studies represents; this is hopefully just an opening to more conversation. In the experience of actually teaching the seminar, have things changed from how you originally envisioned them? Rebecca: I would say it’s less teaching. We wanted an approach where everybody has knowledge and experiences to bring to the seminar, one where everyone has their own interpretation of the reading. We planned activities, whether that’s an activity or certain discussion questions or ways to think about the themes from the readings for that week. But I don’t necessarily want to be the expert in the room. We have read the texts before and have talked about it in previous classes, but the seminar is a space for everyone, including us, to learn. Liana: I think that’s one of the best parts of this. I am sad that not many people could do our seminar, but since it is small, I really feel like we do learn from each other. We’ve only met twice so far, but both times participants in the seminar have brought up things that I wasn’t thinking about before. We’re also very open—if they don’t want to talk about something, then we don’t force it. We don’t see ourselves as teachers or gatekeepers of knowledge. I think with studies on minority groups, there’s this idea that you can speak for your experience. But something that we talk about, especially within Asian groups, is the problem that there’s this idea of the monolithic Asian identity. That’s simply not true and erases so many identities, which is very problematic, especially when you consider certain stereotypes to be representative of all Asian groups. What’s been the most interesting activity or occurrence so far? Liana: The first time we met we were thinking of ways to get out of the traditional discussion seminar format. We were up in VCAM 201, with that moving whiteboard, so we put it in the center of the room and had the group split in two. They each were tasked with “doing something” with themes from the reading. That could be whatever they wanted: drawing, writing, making a graph, something interactive, symbolic. The seminar is a small group so I hated to break it up even further. But for one side to explain to the other side—to go around to the other side and see how the other group understood that—was very cool. We ended up having two very different ways we went about thinking about the readings. In the future, what are you looking forward to? What do you think might change or evolve going forward? Rebecca: We’re still working to figure out what we want and want to incorporate, especially taking other students’ opinions and what they want. We’re thinking of going out to Philly. There’s an organization called the Asian Arts Initiative that hosts a lot of movies for the Pan Asian American Film Festival (PAAFF). We might go to some of the films together, hang out, and eat food. And we’re figuring out what people want, but we’re going to have a guest speaker. It’s something to look forward to even if it’s still in the planning process. Student Seminar Applications for Fall 2019 are due on March 29, 2019. Apply on the HCAH website. Interview by Colin Battis ’21. Edited by Matthew Ridley ’19. Photos by Claire Chenyu-Wang ’20.